Economic Effects of the Sequester and the Proposed Alternatives: What is the Evidence on Spending and Economic Growth? After much political theater, the sequester has arrived, meaning that without further legislative action, federal spending will be cut by $85 billion this year and $1.2 trillion over ten years. This is roughly 2.4 percent of the budget and 0.5 percent of GDP per year. The cuts are evenly split between defense-related discretionary spending and non-defense discretionary spending, so the pain will be felt mainly by Washington, D.C. and other towns dominated by federal spending, such as those with large military bases. There is no denying that many people in these towns will see a pay cut, be furloughed, or be laid off entirely as a result of these cuts, and there may not be many private sector opportunities for them. This is real pain for real people, who may have to reduce their spending and/or find work in the private sector by retraining or even moving to places with low unemployment, such as North Dakota. President Obama and others have promoted these rather obvious immediate effects while downplaying or ignoring the more positive long term effects. If left in place, the sequester will reduce the federal debt, which would bring some stability to financial markets and investors by making a Greek-style meltdown less likely. Less obvious are the benefits in terms of freeing up resources for the private sector, i.e., those laid off workers and those dollars which may now be employed to develop the next iPhone rather than the next tank. Further, the possibility remains that former government workers will find the private sector more enjoyable. Keynesians will argue that Apple isn’t hiring, that when unemployment is high the government is the best, the only, employer. Other economists counter that unemployment is high because of slow economic growth caused by an overbearing government. Ultimately, it is an empirical question as to the degree to which such spending cuts might affect the overall economy. Likewise, in what will likely be ongoing negotiations about how to avert the pain, empirical evidence can help determine whether it makes sense to replace the sequester with either other spending cuts, or tax increases as Senate Democrats have proposed. The Congressional Budget Office (CBO) estimates that the sequester will shave about 0.6 percentage points from economic growth this year, but, due to reduced debt, such a policy would start to increase GDP in two years and after four years GDP would be above where it started. The empirical literature reviewed herein predicts a similar trajectory, but at about half the magnitude. Generally, most research concludes that the type of government spending that is most likely to boost GDP is related to public investment, e.g., defense, roads, bridges, etc. This makes sense, since it involves investment and paying people to work, as opposed to government transfer payments such as Social Security, Medicare, and unemployment, which pay people to retire, consume healthcare, and not work. Unfortunately, the sequester targets mainly public investments, being focused on discretionary spending rather than mandatory spending. Most research indicates that it would be better for short- and long-term economic growth to cut mandatory spending, since it is comprised mainly of transfer payments. The literature also indicates that the worst option of all is replacing some or all of the sequester with income tax increases. Figure 1 shows the major components of federal spending historically and as projected by the CBO under current law, including the sequester. Mandatory spending, such as Social Security, Medicare, and Medicaid, represents the majority of the federal budget and the part that has grown most dramatically in recent years. Mandatory spending was about 10 percent of GDP for most of the 30 years prior to 2008. It leapt to 15 percent of GDP in 2009 and now remains at 13.1 percent. It is projected to increase to 14.1 percent of GDP by 2023. Meanwhile, discretionary spending on programs like defense, roads, and other infrastructure is on a steady decline. 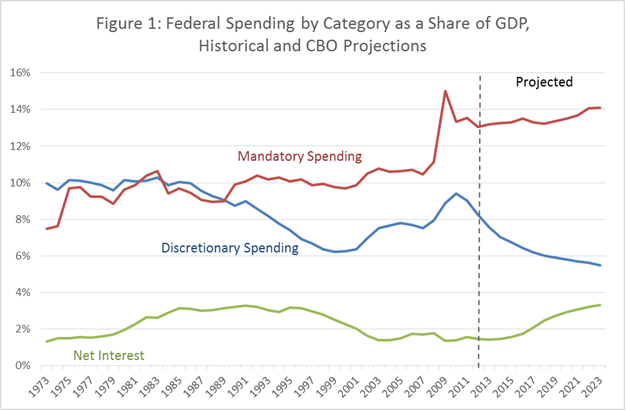 Discretionary spending is now 8.3 percent of GDP and set to go to a fifty-year low of 5.5 percent of GDP by 2023, partly as a result of the sequester. However, this level would be only slightly below that of the late 1990s, which followed the drawdown from the Cold War and preceded the build up for the wars in Iraq and Afghanistan. The bottom line is that the growth in spending in recent and projected years comes from mandatory spending. This is left largely untouched by the sequester. Most estimates of spending “multipliers” are less than 1, meaning an additional dollar of government spending translates into something less than an additional dollar of GDP. Those that are higher than 1 usually fail to properly account for reverse causality, whereby changes in the economy (e.g., recessions) cause changes in spending. A spending multiplier less than 1 could be due to “crowding out,” since resources employed by government must be taken from the private sector. This could manifest itself in various ways, such as government borrowing leading to higher interest rates which in turn reduce private investment. It could also be due to “Ricardian equivalence,” whereby rational people expect higher spending to lead eventually to higher taxes. Barro and Redlick provide the most up-to-date estimates of spending multipliers. They look at variations in defense and non-defense spending in the U.S. over different time periods as far back as 1917. Defense spending provides much more variation, particularly during World War II and the Korean War, and it is of course driven by war rather than economic concerns. Non-defense spending suffers from a relative lack of variation and the problem of reverse causality, whereby economic concerns drive spending. As a result, Barro and Redlick argue that defense spending provides the best means to estimate spending multipliers. For temporary defense spending, their estimates range from 0.4 to 0.5 for contemporaneous GDP effects and 0.6 to 0.7 for GDP effects over two years. The multipliers are higher by 0.1 to 0.2 if the defense spending is permanent. This means an additional dollar of defense spending boosts GDP by less than a dollar (0.4 to 0.8 dollars). The key issue is whether it is satisfactory to use the positive contemporaneous association between nondefense purchases and GDP as evidence for effects of government spending on GDP, rather than the reverse. We think this identifying assumption is unsatisfactory and tends to generate unrealistically high multipliers—because nondefense purchases are typically procyclical. Barro and Redlick argue instead that the nondefense spending multiplier is likely to be less than the defense multiplier because variations in nondefense spending do not involve the command-and-control techniques or the patriotism that attends major war mobilizations. Additionally, Barro and Redlick construct a time series of average marginal income tax rates (AMTR) from 1912 (one year prior to the advent of the federal income tax) to 2006, including federal and state income taxes as well as the social security payroll tax on employers and employees. They estimate the effect of annual changes in the AMTR on the following year’s per capita GDP growth, controlling for changes in defense spending as well as unemployment and credit conditions. They find that a cut in the average marginal tax rate of 1 percentage point raises next year’s per capita GDP by around 0.5 percent. In terms of multipliers, the tax multiplier is -1.1 while the defense spending multiplier ranges from 0.4 to 0.8. This implies that defense spending financed by additional tax revenue reduces GDP. Gemmell et al. steadfastly eschew the language of multipliers but their estimated effects of taxes and spending are largely in line with those of Barro and Redlick. Gemmell et al. use a data set covering seventeen OECD countries between the early 1970s and 2004 to relate economic growth to major fiscal variables. The variables include: “distortionary” taxes, which are taxes on income and profit; “non-distortionary” taxes, which are taxes on goods and services; productive expenditures (e.g., public investments such as defense); unproductive expenditures (e.g., social security and welfare); and deficits. They find that distortionary tax increases are worse for growth than deficits, so raising these taxes to pay down the deficit is a bad idea. They find there are small positive growth effects from deficit financed productive spending, i.e., much of the spending targeted by the sequester. Productive spending paid for by distortionary taxes roughly cancels out in terms of the effect on long-term growth rates. However, the timing matters. Distortionary taxes more immediately reduce growth, while productive spending takes one to two years to increase growth. The result is a permanently smaller economy. Namely, they find that a distortionary tax increase of 1 percent of GDP combined with a productive spending increase of the same size would reduce GDP by about 0.75 percent in the first two years and 0.5 percent over twenty years. Similar studies of different time periods and places largely confirm these results. For instance, Bania, Gray, and Stone look at variations across U.S. states from 1962 to 1997. They find that state and local taxes and fees of all sorts, when directed towards public investments such as roads and education, first add and then subtract from GDP. They find taxes directed towards transfer payments always subtract from GDP. Finally, another set of studies looks at episodes of fiscal consolidation (efforts to reduce deficits) and fiscal stimuli. Alesina and Ardagna cover a large number of such episodes occurring in OECD countries between 1970 and 2006. They find that fiscal stimuli based upon tax cuts are more likely to increase growth than those based upon spending increases. Also, fiscal consolidations based upon spending cuts and no tax increases are more likely to succeed at reducing deficits and debt and less likely to create recessions as compared to fiscal consolidations based upon tax increases. Similarly, the IMF analyzes 170 cases of fiscal consolidation in fifteen advanced countries over the last thirty years and finds that spending cuts are much less damaging to short term growth than are tax increases. They find a 1 percent spending cut has no significant effect on growth, whereas a 1 percent tax increase reduces GDP by 1.3 percent after two years. Further, they find that cuts to transfer payments have statistically zero effect on short term growth, and the point estimate indicates these cuts actually stimulate growth, while cuts to government consumption and investment lower short term growth. They estimate that cutting public investment by 1 percent of GDP lowers GDP by 0.6 percent after 3 years. Other studies of fiscal consolidations come to similar conclusions. The sequester will reduce defense and nondefense discretionary federal spending by $85 billion this year and $1.2 trillion over 10 years, which is roughly 2.4 percent of the budget and 0.5 percent of GDP per year. While this will effectively reduce the deficit and debt, it will do so by mostly exempting the largest and fastest growing part of the budget, mandatory spending. As such, it is poorly targeted. Adding insult to injury is the fact that the sequester cuts areas most likely to lead to economic growth, namely defense, roads, and education. However, because the cuts are a small part of the budget, reasonable estimates based on the empirical literature indicate the sequester will likely reduce GDP growth by only about 0.3 percentage points this year and perhaps next, and then begin to add to growth as a result of lower deficits. This is about half of the effect predicted by CBO. These cuts will most directly impact Washington, D.C. and other towns heavily dependent on federal spending, such as those with large military bases. A better option, according to empirical evidence, is to replace the sequester with cuts to mandatory spending. This may even boost GDP in the short term as well as the long term. The worst option of all, according to most empirical studies, is to replace the sequester in part or whole with higher income taxes. The vast majority of countries who have successfully reduced their debt have done so by reducing spending rather than increasing taxes. Philip Rucker, Impact of Budget Cuts Depends on Where You Live and Who You Are, Washington Post, Feb. 26, 2013, http://www.washingtonpost.com/politics/impact-of-budget-cuts-depends-on-where-you-live/2013/02/26/f117a3c4-802f-11e2-b99e-6baf4ebe42df_story.html. Congressional Budget Office, Macroeconomic Effects of Alternative Budgetary Paths (Feb. 2013), http://cbo.gov/sites/default/files/cbofiles/attachments/43769_AlternativePaths_2012-2-5_0.pdf. For an earlier review of the taxes and growth literature see William McBride, What is the Evidence on Taxes and Growth?, Tax Foundation Special Report No. 207 (Dec. 18, 2012), https://taxfoundation.org/article/what-evidence-taxes-and-growth. Congressional Budget Office, The Budget and Economic Outlook: Fiscal Years 2013 to 2023 (Feb. 5, 2013), http://cbo.gov/publication/43907. Robert Barro & C.J. Redlick, Macroeconomic Effects of Government Purchases and Taxes, 126 Quarterly Journal of Economics 51-102 (2011). See also Andrew Young, Why in the World are We All Keynesians Again? The Flimsy Case for Stimulus Spending, Cato Policy Analysis No. 721 (Feb. 14, 2013), http://www.cato.org/sites/cato.org/files/pubs/pdf/pa721_web.pdf. Barro & Redlick, supra note 5. Olivier Blanchard & Robert Perotti, An Empirical Characterization Of The Dynamic Effects Of Changes In Government Spending And Taxes On Output, 107 Quarterly Journal of Economics 1329-1368 (2002). Perhaps responding to this and other research, CBO has since lowered their “low estimate” of multipliers to match the range found by Barro and Redlick, but CBO’s “high estimate” of multipliers continues to be in the range of 1 to 2.5. See Congressional Budget Office, Estimated Impact of the American Recovery and Reinvestment Act on Employment and Economic Output from October 2012 Through December 2012, (Feb. 2013), at Table 2, http://cbo.gov/sites/default/files/cbofiles/attachments/43945-ARRA.pdf. N. Bania, J. A. Gray, & J. A. Stone, Growth, taxes, and government expenditures: growth hills for U.S. states, 60 National Tax Journal 193-204 (2007). For a summary, see David Logan, The Proper Role of Taxes in Deficit and Debt Reductions, Tax Foundation Fiscal Fact No. 278 (July 29, 2011), https://taxfoundation.org/article/proper-role-taxes-deficit-and-debt-reduction.